The 2016-17 school year will feature a number of new teacher-mentors at Sonoran Schools academies in Phoenix and Tucson. Eighteen of our educators have been trained in a new formative assessment program and will use their expertise to mentor and support their peers when the new year begins. The Arizona Department of Education and WestEd, a nonprofit research and development agency, invited Sonoran Schools along with other charter and public districts in Arizona, to participate in a professional development program on formative assessments created by Margaret Heritage of the National Center for Research on Evaluation, Standards, and Student Testing at the University of California, Los Angeles. Formative assessment refers to a wide variety of methods that teachers use to conduct evaluations of student comprehension, learning needs, and academic progress. Formative assessments help teachers identify concepts that students are struggling to understand, skills they are having difficulty acquiring, or learning standards they have not yet achieved so that adjustments can be made to lessons and instructional techniques. The general goal of formative assessment is to collect detailed information that can be used to improve instruction and student learning while it’s happening rather than testing or evaluating after instruction has ended. Heritage’s formative assessment pilot course is six months long, a much longer commitment than most teacher professional-development programs. 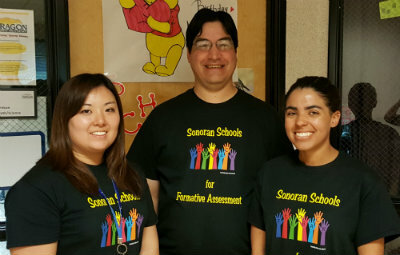 Sonoran Schools’ 18 educators joined about 3,500 from seven Western states in taking the course; they will share the practices they have learned with their peers by conducting presentations of formative assessment strategies during Sonoran Schools’ professional development meetings. They have also agreed to allow other teachers to observe them using these practices in their own other teachers' classrooms. 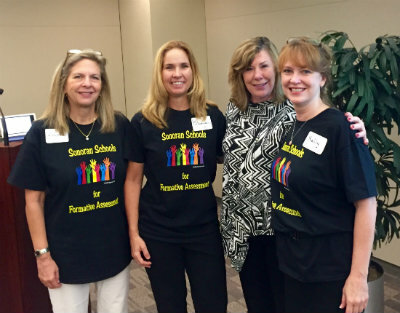 “We were fortunate to have Arizona Department of Education and WestEd support to train our teachers last school year, and are excited to be part of a new grant to continue supporting implementation of formative assessment strategies for a second year,” says Hobbins. The leadership of Sonoran Schools believes the quality of a teacher is the primary factor that determines student achievement. Our participation in the initiative to share the power of formative assessment is part of a commitment to recruit and retain teachers who are talented, passionate, experienced and highly qualified. Sonoran Schools educators with UCLA’s Margaret Heritage. Left to right, Laurie Horewitch, Shannon Wise, Heritage, Kelly McQuaid. Paragon Science Academy teachers, left to right, Jennifer Shin, Brady Parkhurst, Amber Richardson.